TMForum offers catalysts as solution proof-of-concepts. A catalyst involves a number of vendors which partner together to demonstrate an end-to-end solution to a real problem faced by telco providers or the defense industry. 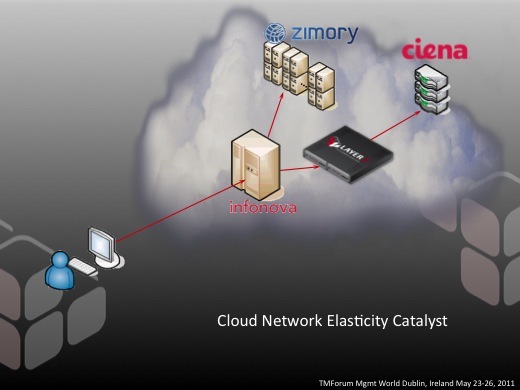 This year, we’re working closely with Infonova, Zimory, and Ciena to showcase a cloud-in-a-box environment that features elastic scaling of compute resources and network bandwidth on-demand, all of which is fully integrated with an automated billing system.We think this solution will be a significant game-changer in the cloud infrastructure marketplace, and Layer 7′s CloudControl product is a part of this solution. CloudControl plays a crucial role in managing the RESTful APIs that tie together each vendor’s components. The front end is driven by Zimory’s BSS system, ensuring that all user actions are managed under a provider-grade billing framework. And finally, Layer 7′s CloudControl operates as the glue in the middle to add security and auditing, integrate disparate APIs, and provide application-layer visibility into all of the communications between different infrastructure components.